RIT President David Munson said exciting changes are in the works in RIT’s revised 2025 Strategic Plan that will help the university get closer to becoming a top-50 university, yet unlike any other top-50 university in the nation. Rochester Institute of Technology President David Munson said exciting changes are in the works in RIT’s revised 2025 Strategic Plan that will help the university get closer to becoming a top-50 university, yet unlike any other top-50 university in the nation. He quoted the plan’s vision, which he said will streamline 121 goals reflecting RIT’s collective strategic vision in the 2015 Strategic Plan to 44 goals, while preserving critical aspects including student success and diversity. People: Building a Creative and Diverse Community. The credit for the RIT difference belongs to its people. We will attract and support an extraordinary mix of increasingly creative multi-talented students, faculty and staff, and we will continue to diversify all segments of our community. Programs: Fostering and Exercising Creativity. RIT’s students constantly seek new ways of thinking, doing and making. We will serve the aspirations of our students by integrating our core strengths in technology, the arts and design, and continuing to grow programs in all forms of experiential learning. Places: Facilitating our Creative Community. To attract the most talented and creative people, we must provide a welcoming physical environment that is conducive to the connecting, making and imagining that will define their RIT experience. Anticipated new and renovated facilities to support the centrality of creativity, design, learning and making include an integrated Student Alumni Union/Center for Immersive Learning and Making/Wallace Library, a performing arts center and outdoor interactive installations embodying art/technology integration. Anticipated new and renovated facilities to support research and graduate students include a cybersecurity addition to the B. Thomas Golisano College of Computing and Information Sciences, conversion of some classrooms to research and graduate student office space, and an engineering and science research laboratory building. Partnerships: Extending our Reach and Serving the World. RIT has a long history of successful partnerships. We will remain committed to the enrichment of our local community, continue our close relationship with New York state and search for promising new partners at the national and global levels. Overseas partners will increasingly afford enriching experiences for our students and faculty and will become a source of talented undergraduate and graduate students for the RIT home campus. He said there is no university better equipped to realize this vision. “RIT has tremendous capital in all the right places – in its diverse and variously talented people, its deep and unique program portfolio, its defining commitment to students and its socially responsible culture,” he said. Munson also discussed the yearlong celebration of RIT’s 50th year at its Henrietta campus, the new Lobozzo Alumni House on the west side of campus, and the October dedication of MAGIC Spell Studios, which includes a 7,000-square-foot state-of-the-art sound stage, a high-tech theater with a projection booth and a cinema-quality audiovisual system, sound mixing and color correction facilities, numerous labs and other production facilities. 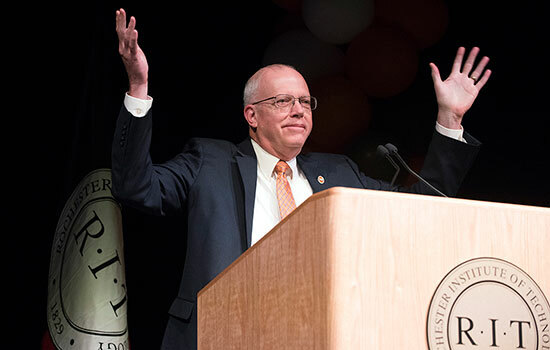 Munson also congratulated students, faculty and alumni that won awards and accolades – including a Pulitzer Prize and an “Inventor of the Year” – and discussed the $1 billion “Transforming RIT: The Campaign for Greatness” fundraising campaign announced this summer. More than $530 million has been raised so far, from alumni and friends, government and corporate partners and research foundations and agencies. The money will be used to attract exceptional talent, enhance the student experience, improve the world through research and discovery, and provide future initiatives.